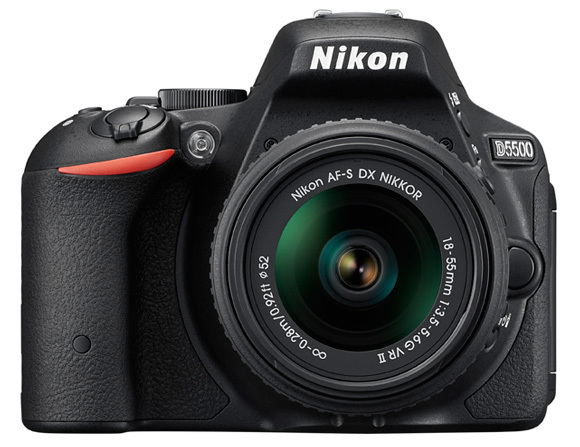 The new Nikon D5500 features the same 24.2Mp DX format sensor as its predecessor with the Optical Low Pass Filter removed for sharper and crisper images. The new Nikon D5500 is the latest model in Nikon’s range of DX format DSLRs and sits in between their entry-level D3300 model and flagship DX offering, the D7100. The big news on the D5500 is the inclusion of a touch screen LCD, which is a first on a Nikon DX format camera and brings Nikon up to speed with the Canon who have been boasting such technology for a little while now. 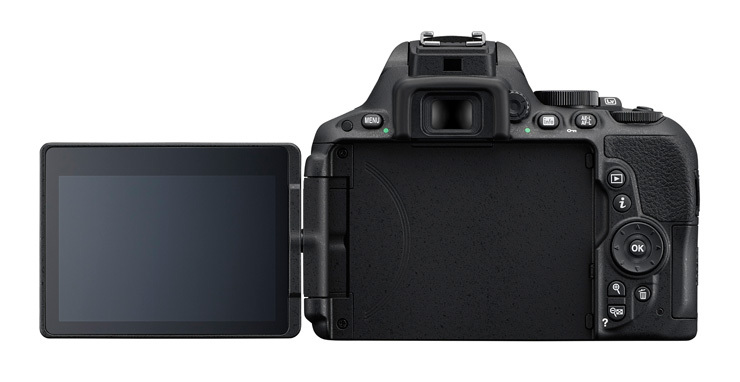 In terms of camera control, as well as setting your focus point or firing the shutter using the touch screen, the new LCD on the Nikon D5500 also enables finger swipe control for changing settings thanks to the new Touch-fn button. It’s possible to assign one of up to eight different functions to the Touch-fn button, including settings like aperture or ISO, which you can then adjust by simply swiping a finger across the LCD screen. As well as touch screen, the new 3.2in 1.4m-dot resolution LCD on the D5500 is also the vari-angle variety, making it easier for photographers to frame up and shoot from awkward angles. The LCD’s vari-angle control together with touch screen and finger swipe controls should be appreciated by both videographers, and snappers after the perfectly composed ‘selfie’. Nikon claim the new D5500 is also significantly lighter and slimmer than it’s predecessor the D5300, but with a deeper and better-sculpted handgrip for improved handling. In many other respects however the new Nikon D5500 features a very similar feature set to the D5300. Built around the same 24.2Mp APS-C sensor, which has its Optical Low Pass Filter removed for sharper and more detailed images, the new Nikon D5500 offers the same resolution as its predecessor the D5300 and Nikon’s alternative D3300 and D7100 DX format offerings. The D5500’s ISO range covers ISO 100-25,600, there’s also built-in wi-fi for easily sharing images or controlling the camera via a Smart device, and Nikon’s EXPEED 4 image processing engine enables continuous shooting up to 5 frames per second. The D5500’s autofocus system also utilises the same 39-point system from the D5300, including nice cross-type sensors, but Nikon claim the new Nikon D5500’s contrast detect autofocus system (that’s the one you use with Live View) is now 20% faster than the D5300. The new Nikon D5500 will be available from 5th February 2015 with prices around ¢799 body only, ¢899 including 18-55mm VR II lens or ¢1,129 with the 18-140mm VR lens. With an excellent track record for image quality and featuring the same sensor and resolution as the D5300 we should expect some class leading scores from the new Nikon D5500. 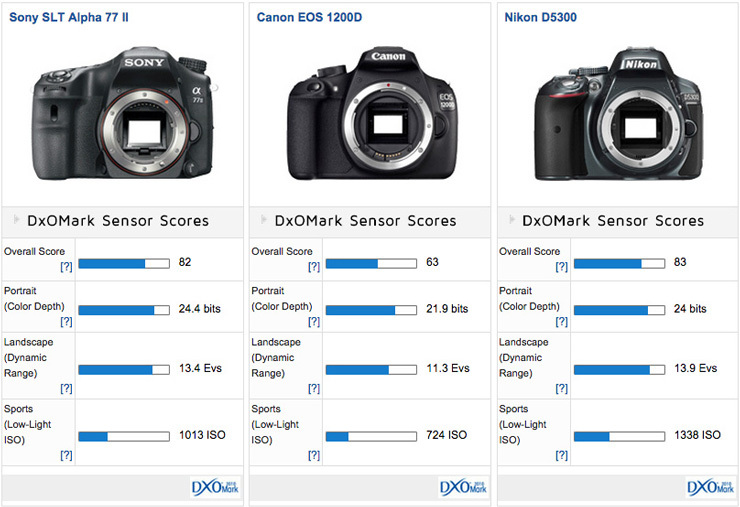 Until we get our hands on the latest model lets take a look back at the scores for current Nikon DX DSLRs as well as some of the competition. 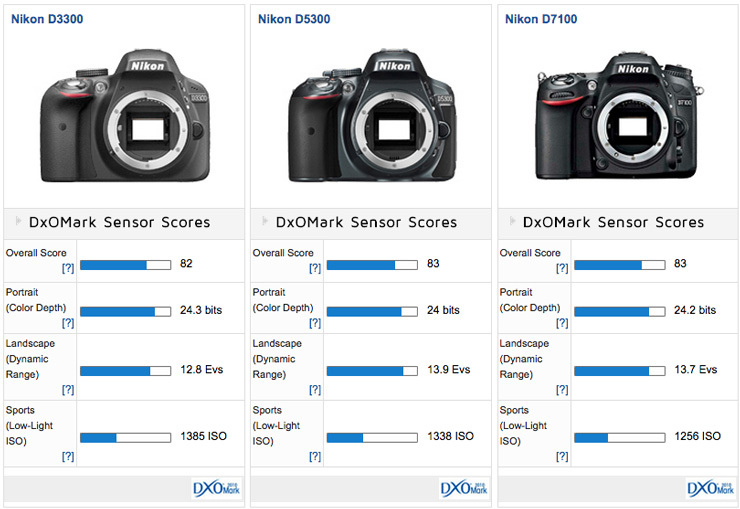 Nikon DSLRs top the DxOMark rankings for APS-C sensors with the D5200, D7100 and D5300 taking the top three spots and we can expect similar results from the new Nikon D5500. 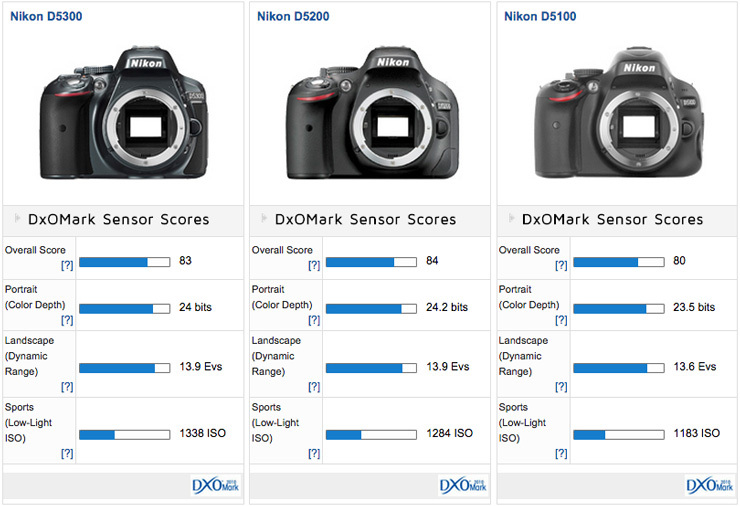 Very similar scores for the D3300, D5300 and D7100 with the only significant difference being Dynamic Range where the D7100 & D5300 offer a 1 stop improvement over the D3300. 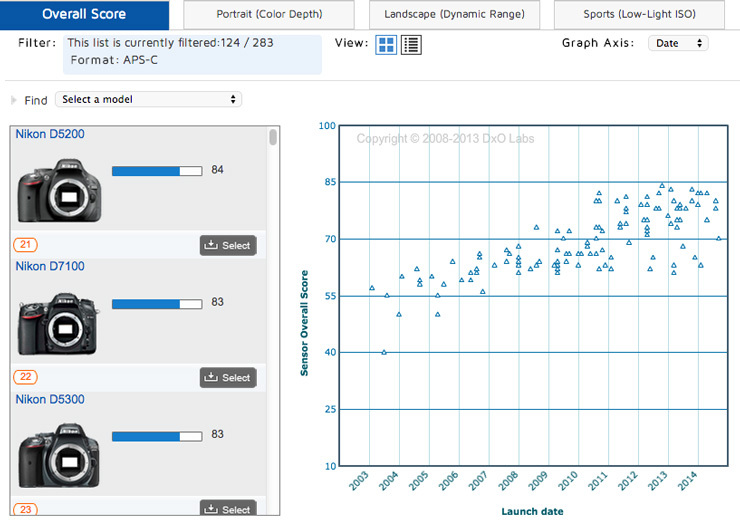 There’s hardly anything in it between the D5300 & D5200 for sensor performance but both models do offer a modest improvement over the older D5100 model in all the sub scores. Against the main APS-C DSLR competition the Nikon D5300 just gets the nod over the Sony 77II with both being notably ahead of the Canon 1200D in terms of DxOMark Sensor Scores.